LG V35 ThinQ with 6-inch FullVision display, Snapdragon 845 processor and 6GB RAM goes official. 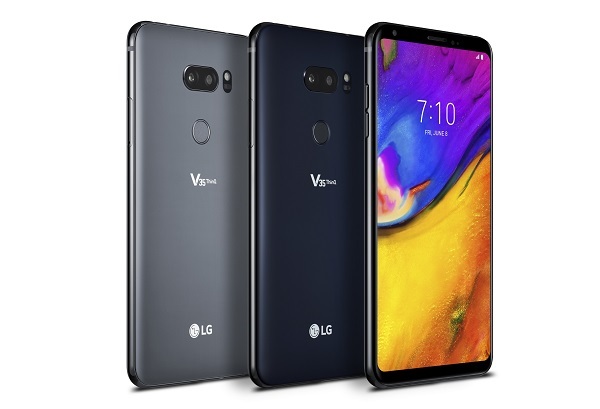 LG Electronics today announces the V35 ThinQ, the latest iteration of its highly acclaimed V series of premium multimedia smartphones. The newest V series device will be rolling out in the Americas starting in June followed by limited markets in Asia, Middle East and Africa. The LG V35 ThinQ features a 6-inch 18:9 OLED FullVision display with QHD+ (2880 x 1440) resolution in a compact form factor that weighs only 157g and measures a thin 7.3mm. The display is further accentuated with the scratch-resistant Corning Gorilla Glass 5 that is curved around the edge for a sleek and premium feel. The device features the latest Qualcomm Snapdragon 845 mobile platform paired with 6GB of RAM and 64GB/128GB of internal storage. The LG V35ThinQ is built to withstand the rigors of daily use with its IP68 rating for dust and water resistance and a passing grade in 14 of the US military's MIL-STD 810G tests for reliability of equipment performance in harsh environments. The new V35 ThinQ features the new Super Bright Camera to capture low light images that are approximately four times brighter. With the help of pixel binning and advanced software processing techniques, the AI algorithm determines the best settings when shooting in dim environments. The newest V series device will be rolling out in the Americas starting in June followed by limited markets in Asia, Middle East and Africa. Additional details including price and purchase locations will be announced locally at the time of availability.